Chestnut Theatre School is open for all ages and abilities. 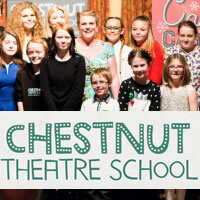 Our aim is to help people develop be it in acting or singing or even in your personal life. We pride ourselves on building confidence whilst progressing in something you love and enjoy. Group drama and acting classes are every Tuesday 4pm-10pm, from Stockport Masonic Guildhall (opposite Stockport college on the A6). We offer classes from 5 years old to 20+. Classes run term time and have a course layout from the start so pupils are aware of what subject they will be focusing on each term. There will always be a fixed aim for the end of term, whether it is a performance or filming a piece that we have been working on, this will then be evaluated and progress can be seen. This means everyone has a goal and something to show.